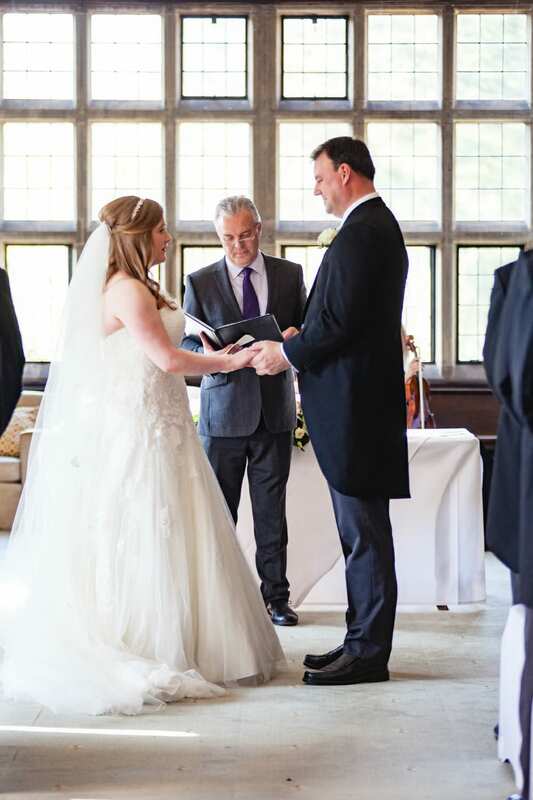 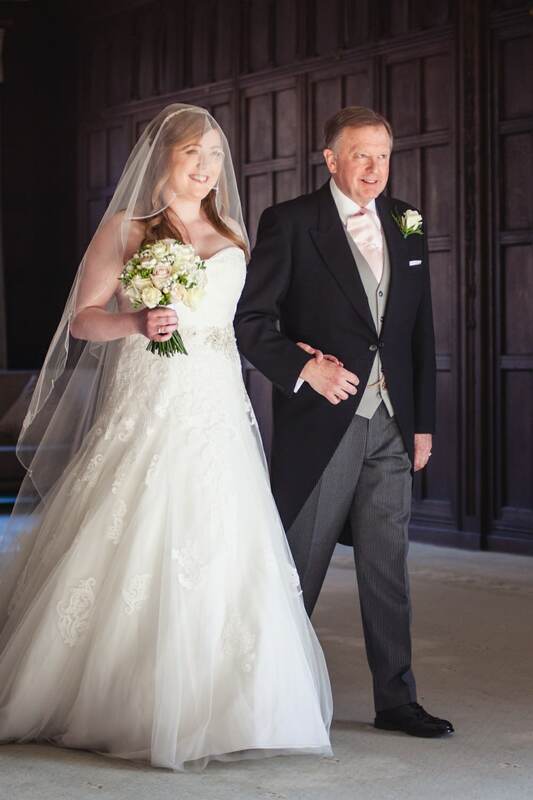 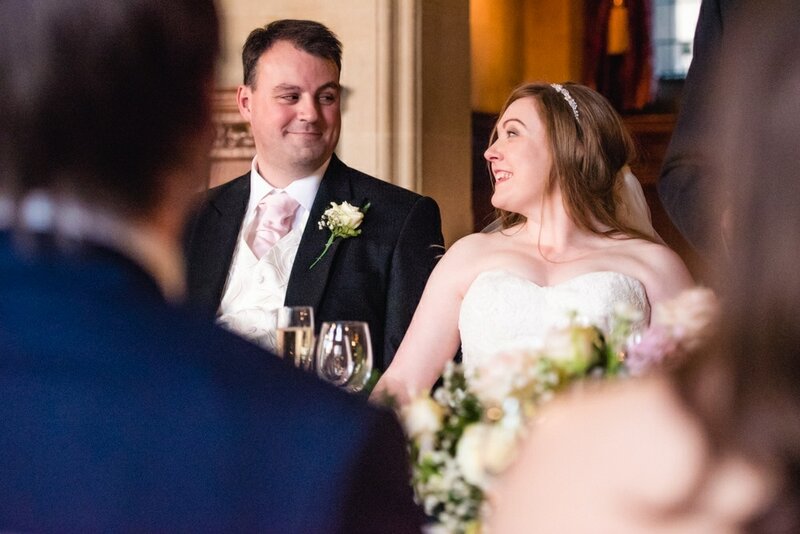 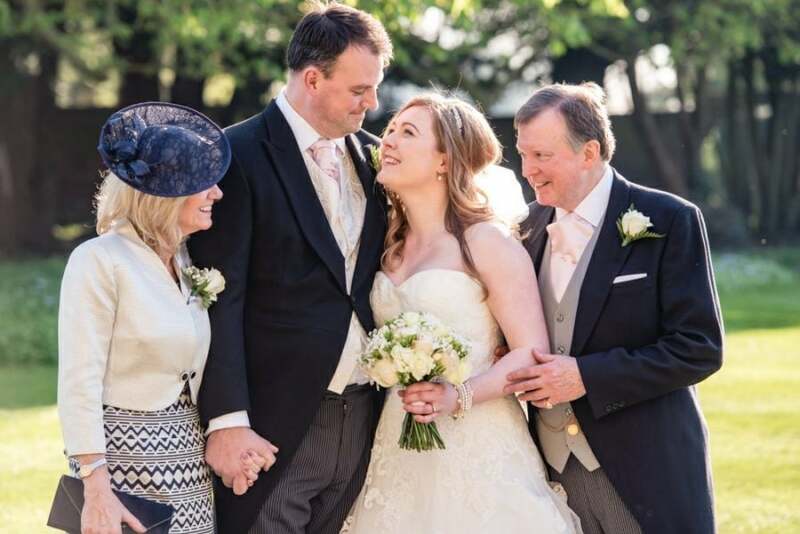 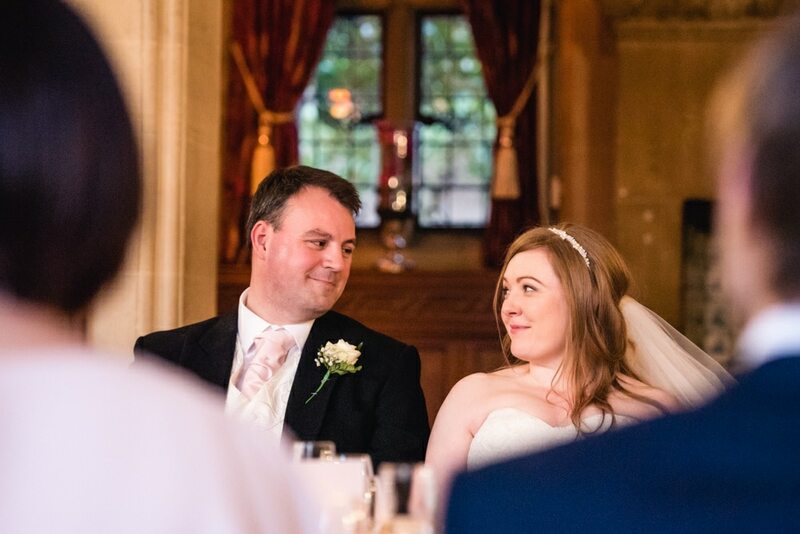 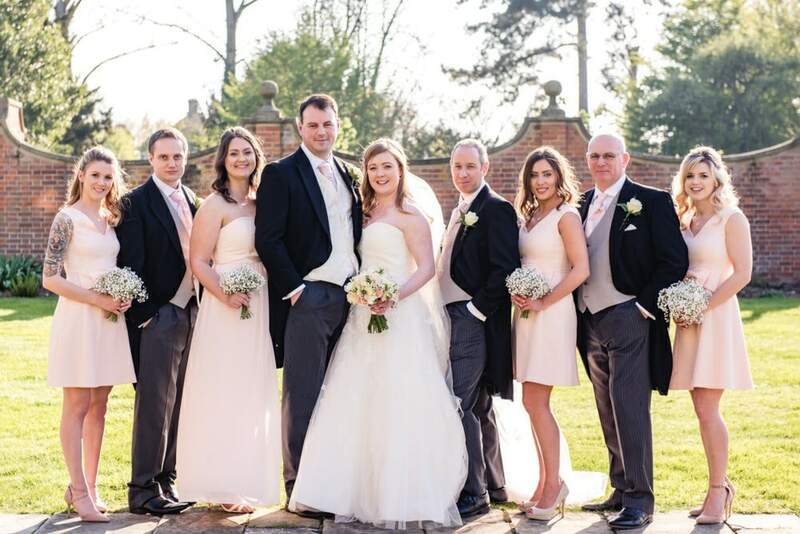 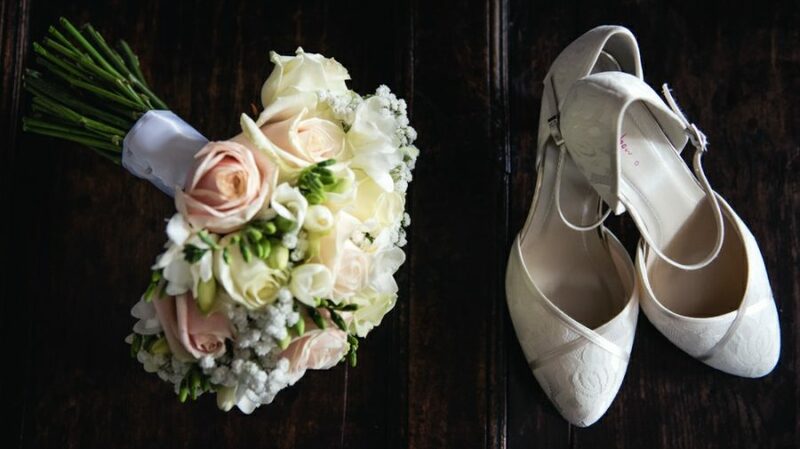 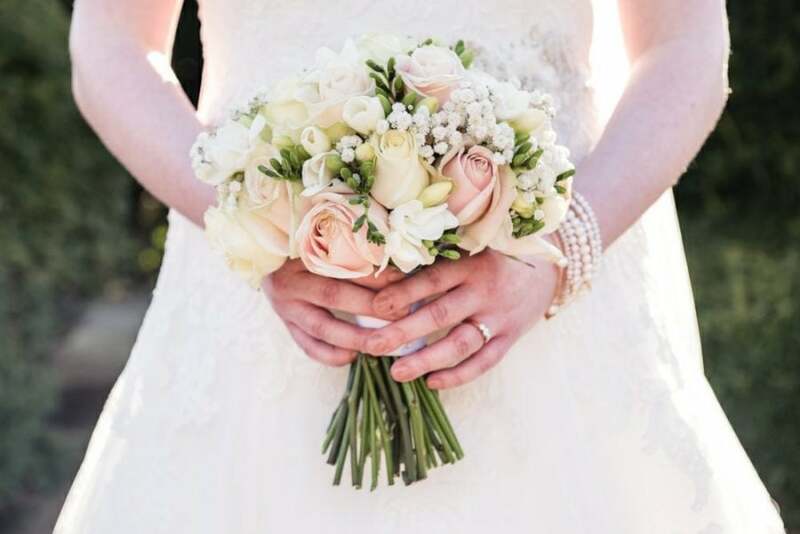 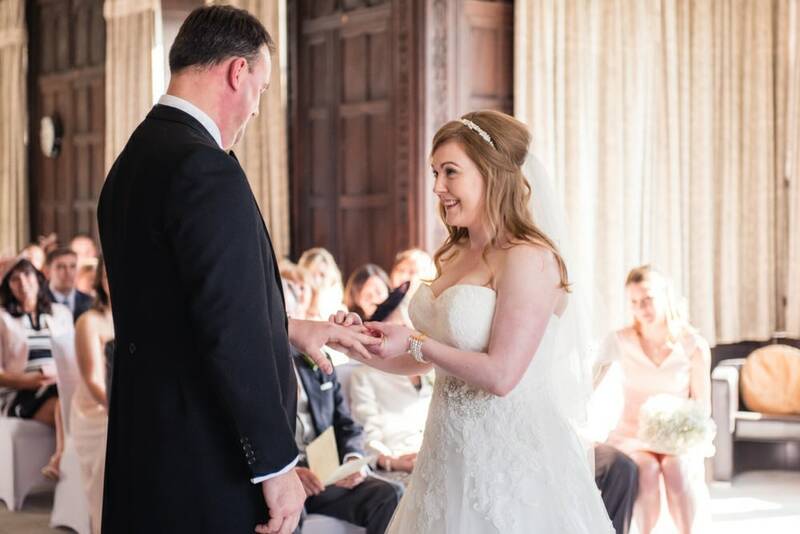 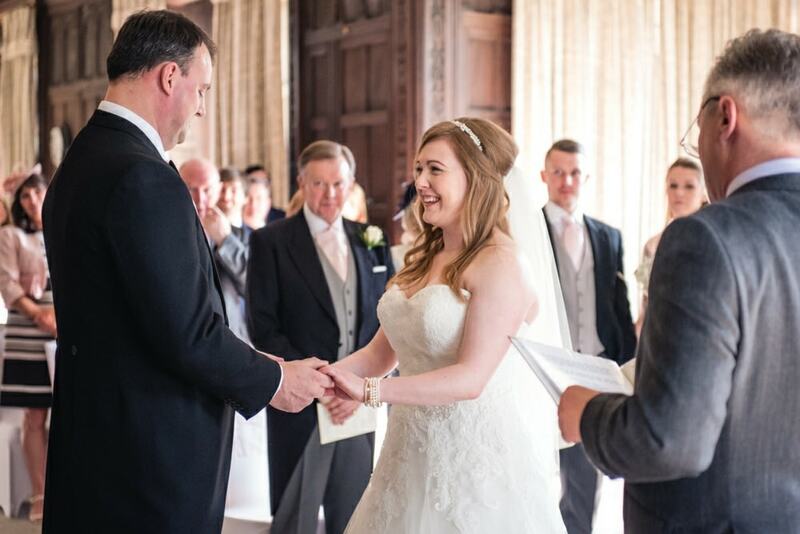 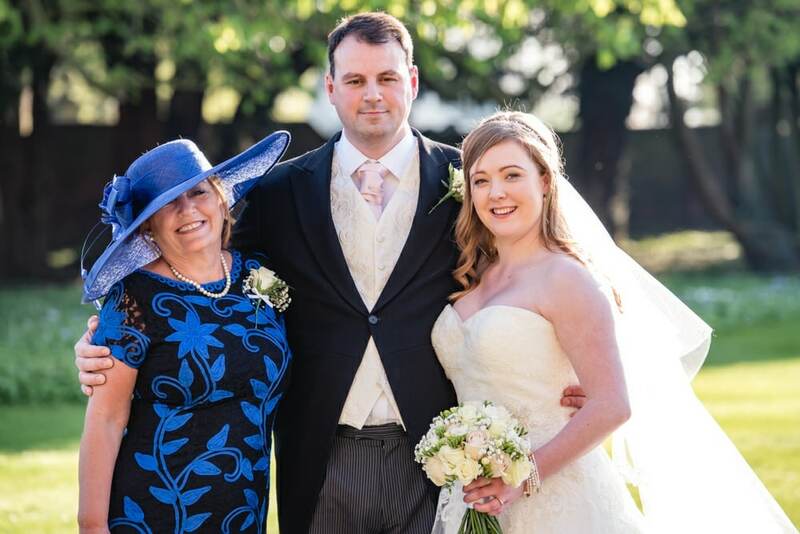 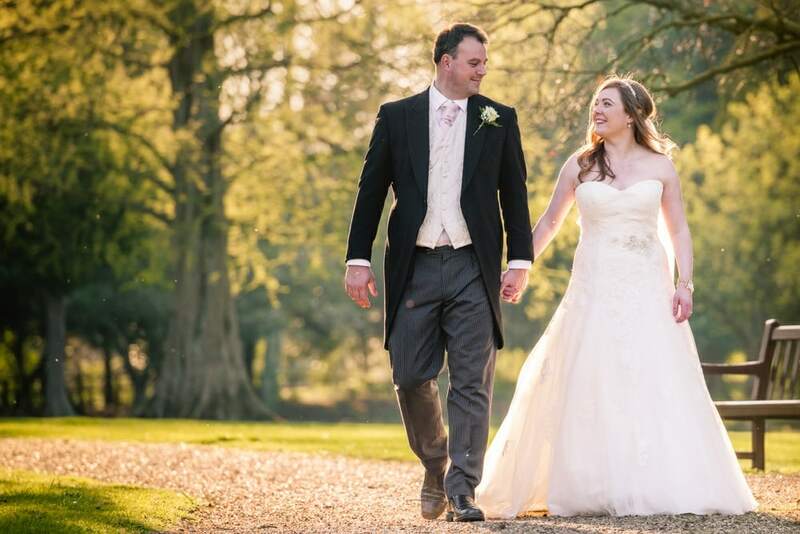 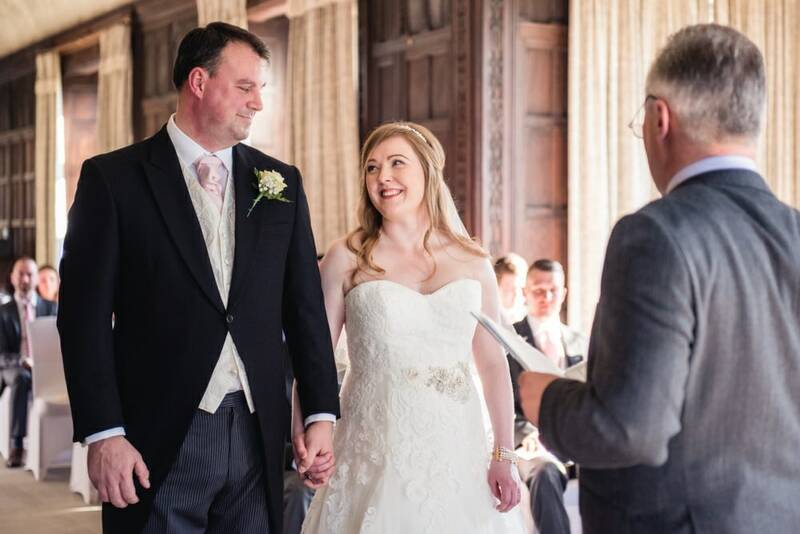 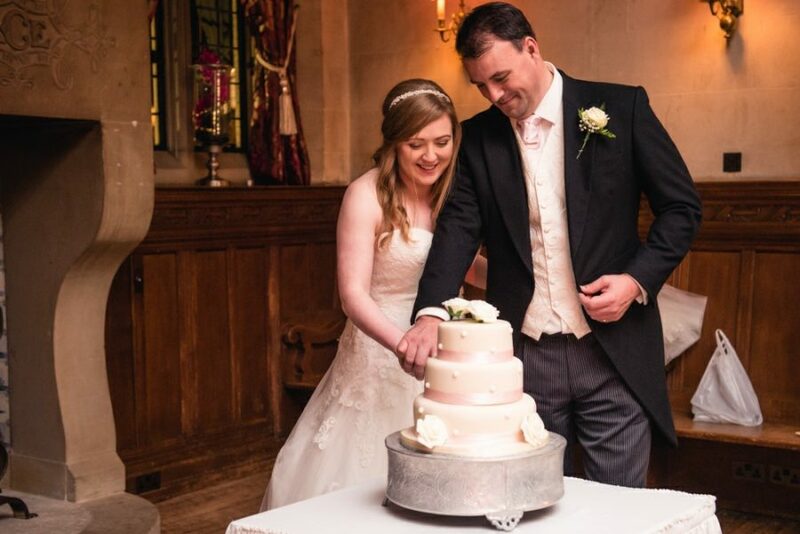 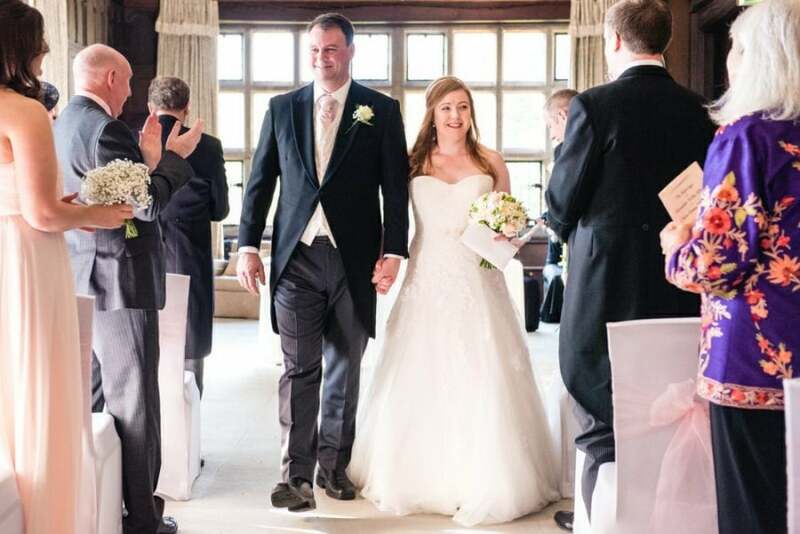 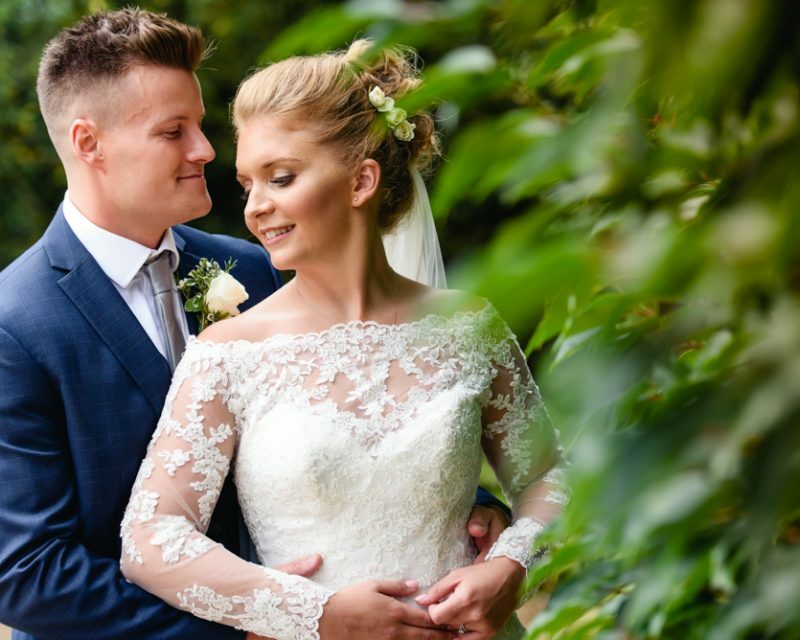 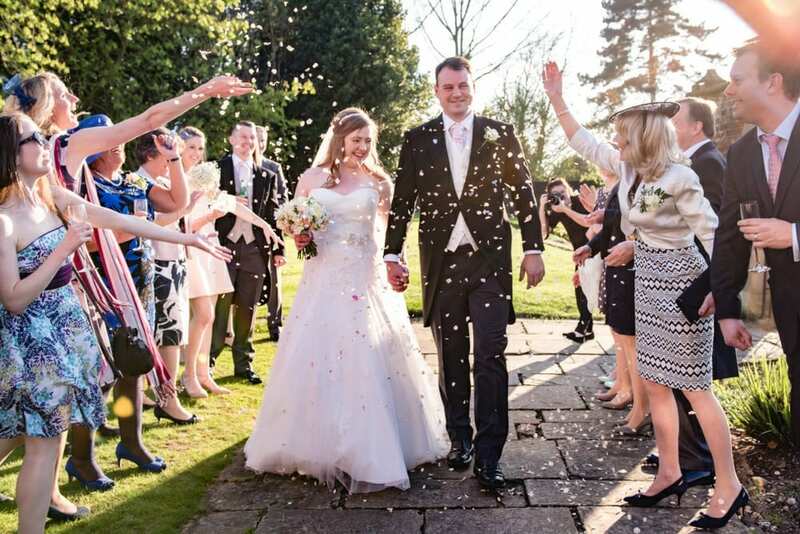 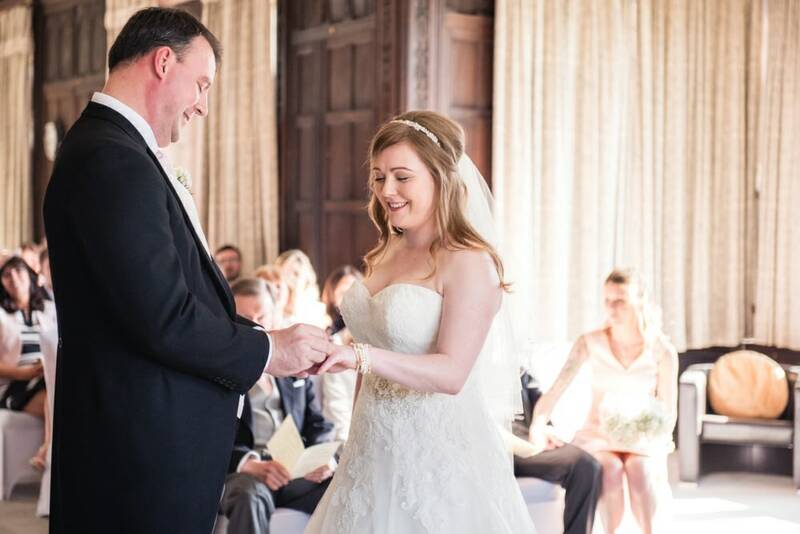 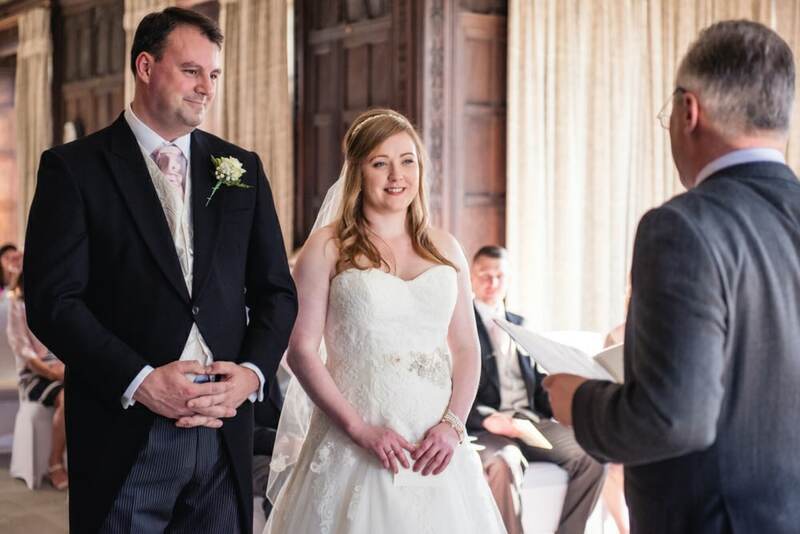 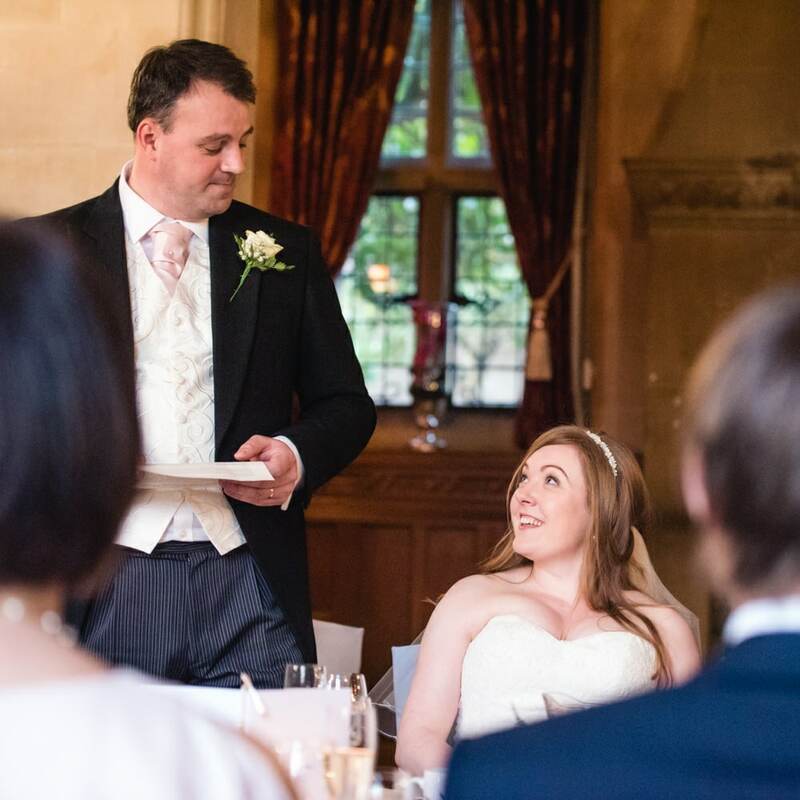 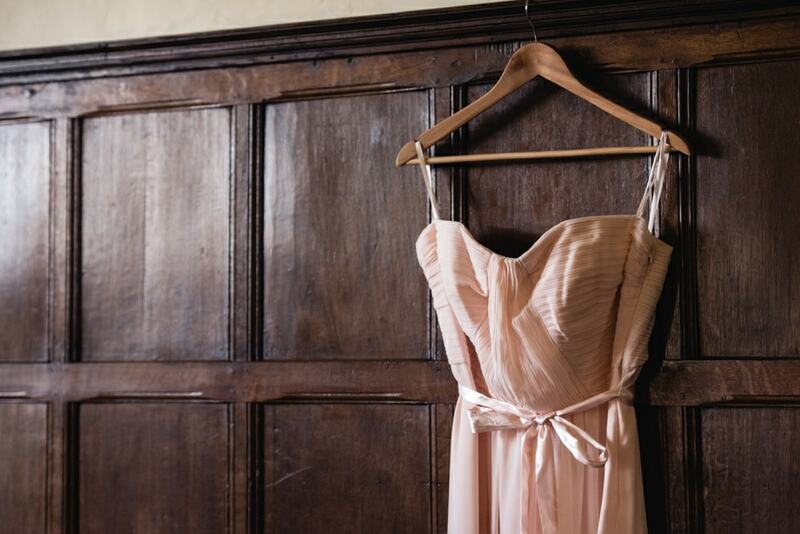 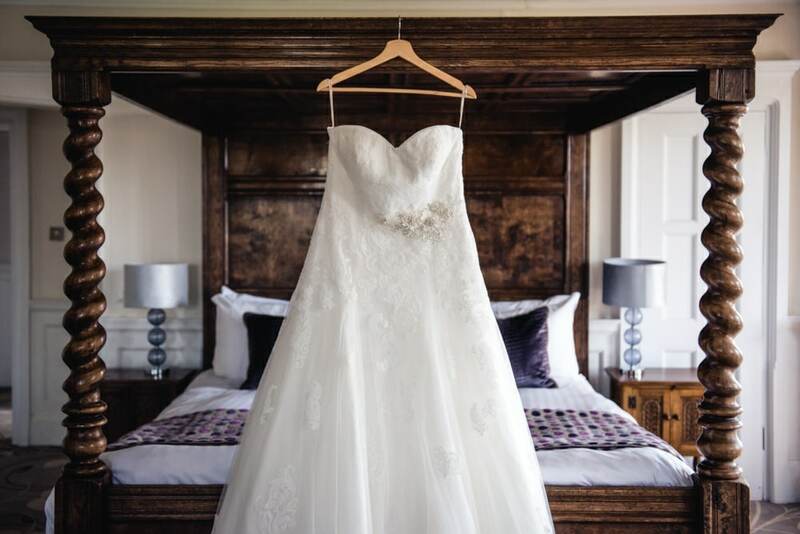 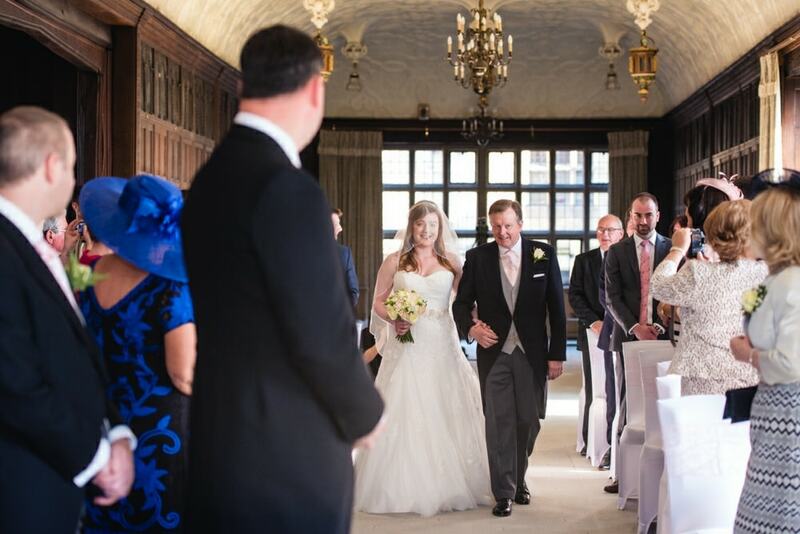 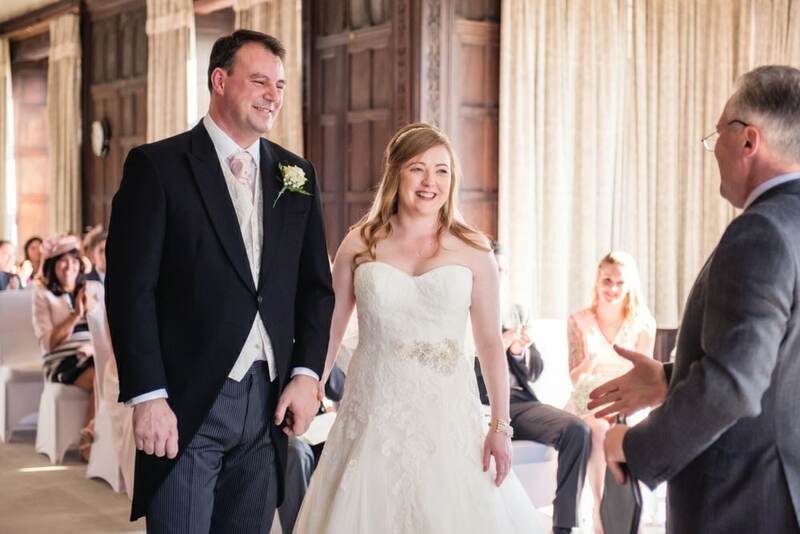 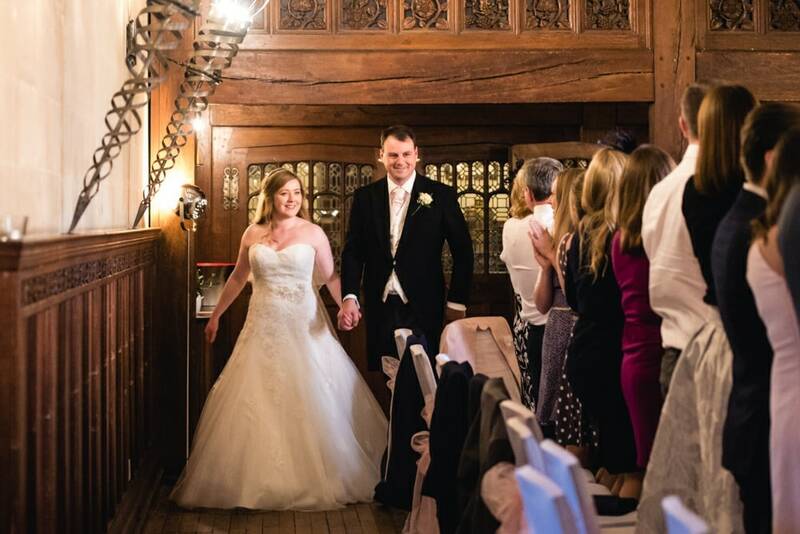 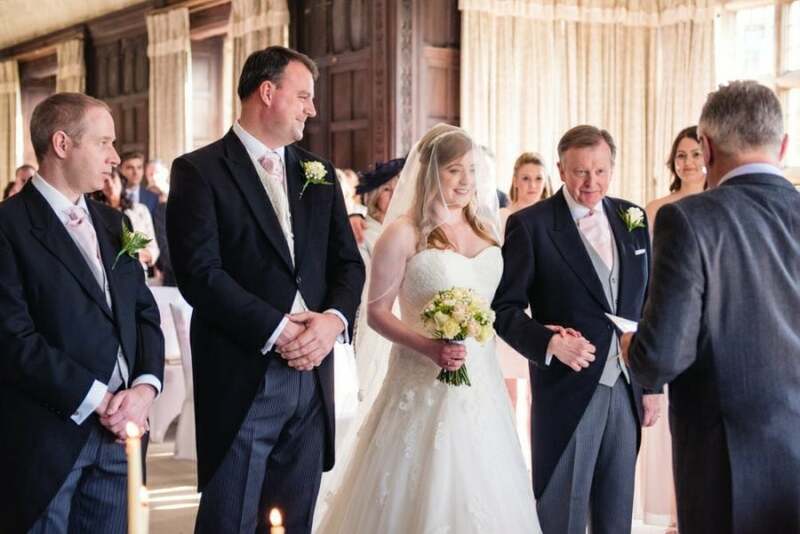 Claire and Alex got married at Fanham’s Hall, a beautiful old manor house in Ware, Hertfordshire. 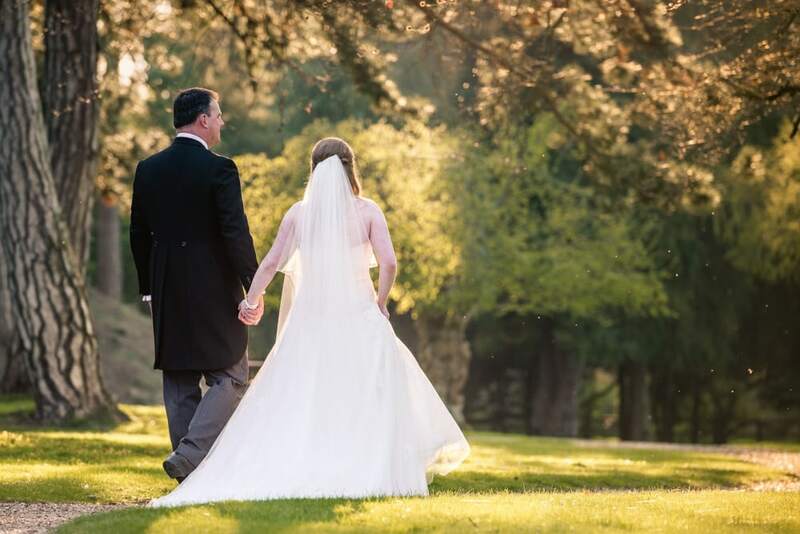 It was an unseasonably hot spring day and the venue’s perfectly manicured gardens were in bloom. 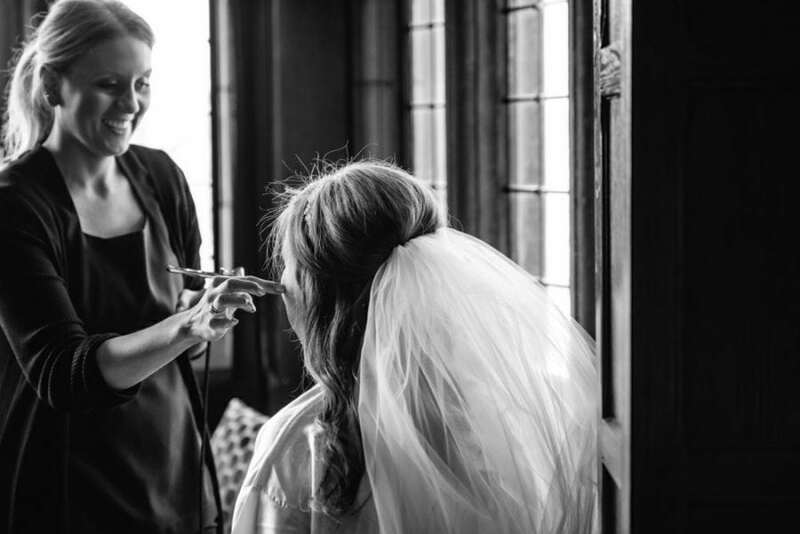 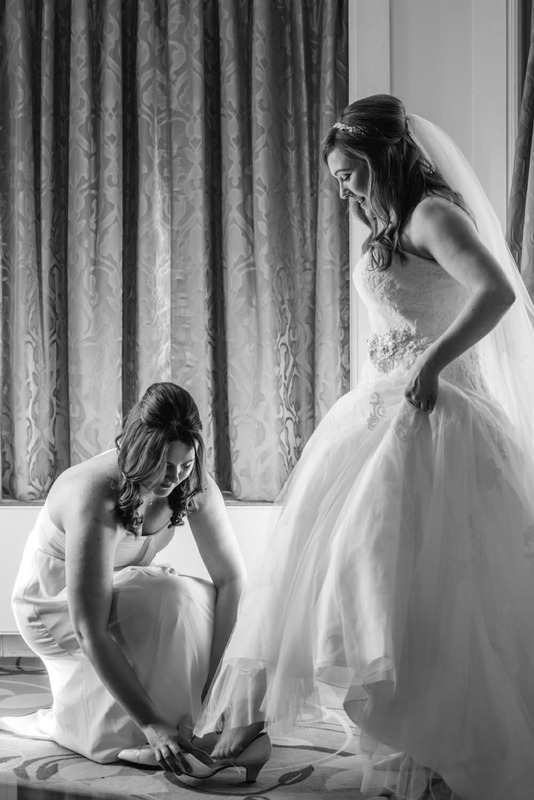 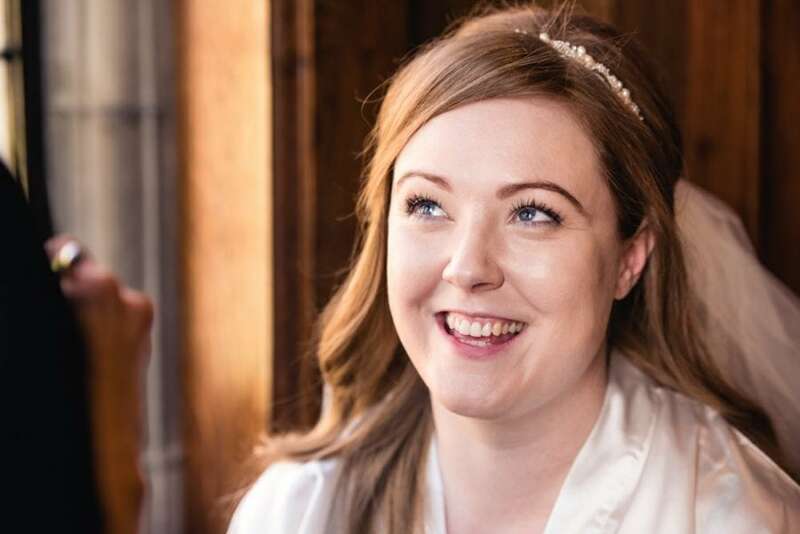 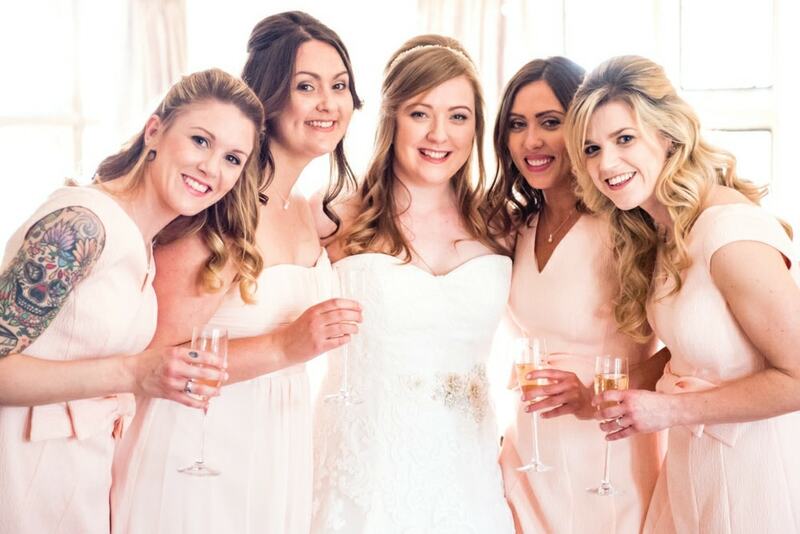 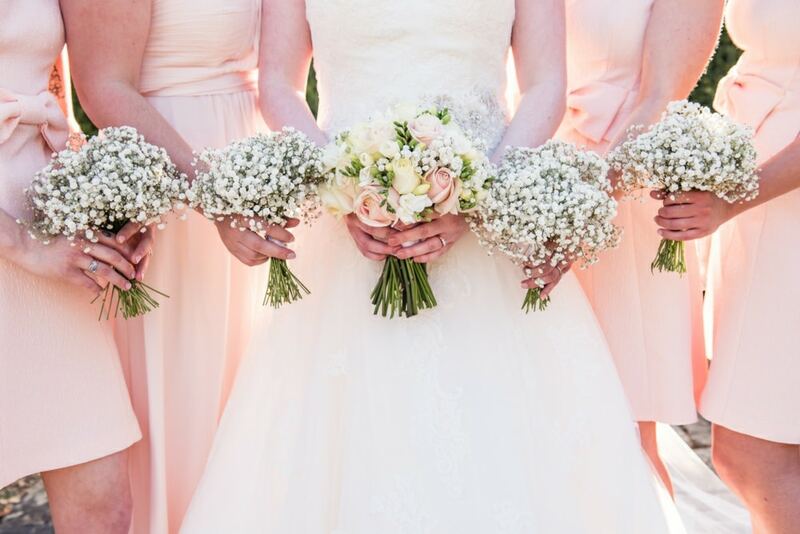 Claire got ready in the bridal suite with her hilarious bridesmaids and their reaction was priceless when they saw the bride in her stunning lace dress. 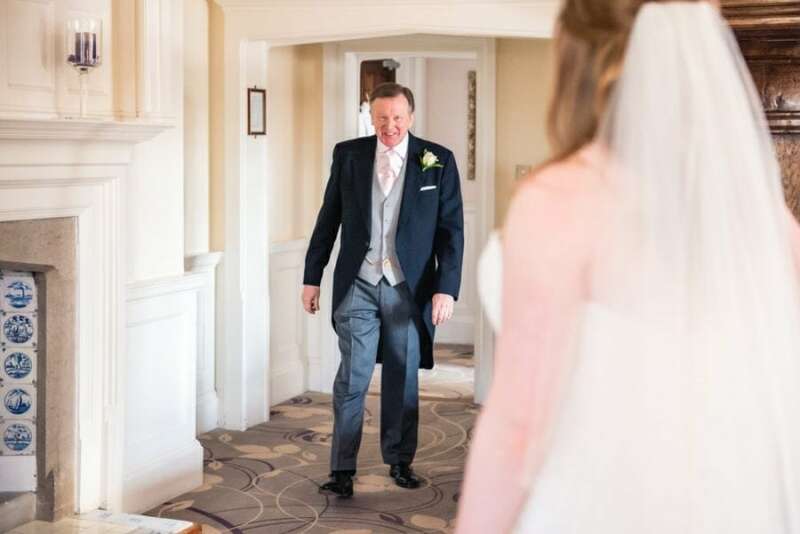 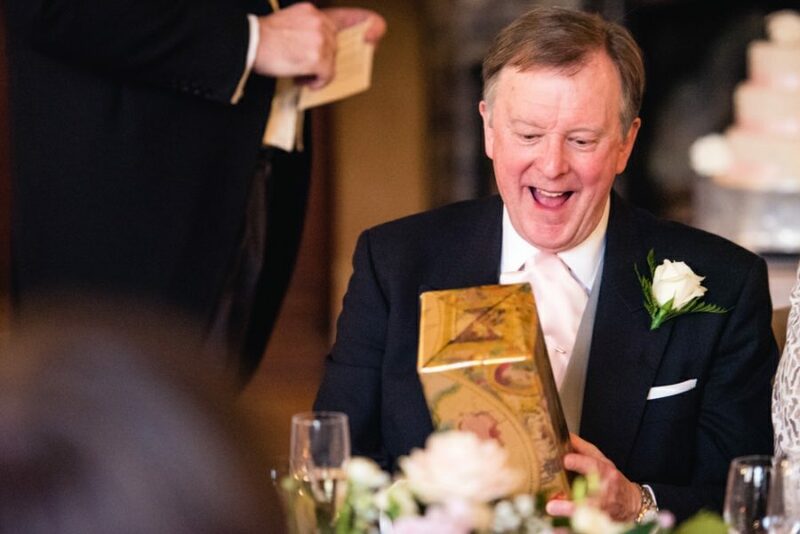 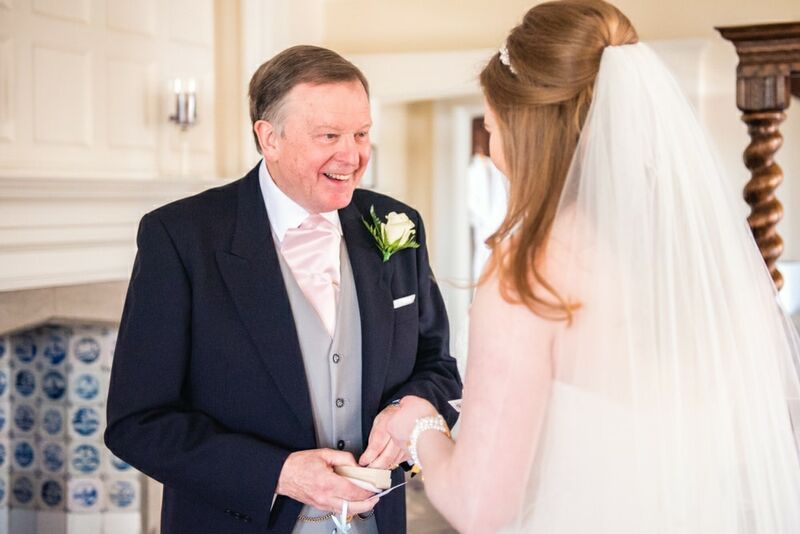 Claire’s dad looked overjoyed as he handed Claire a silver sixpence to wear in her shoe for luck. 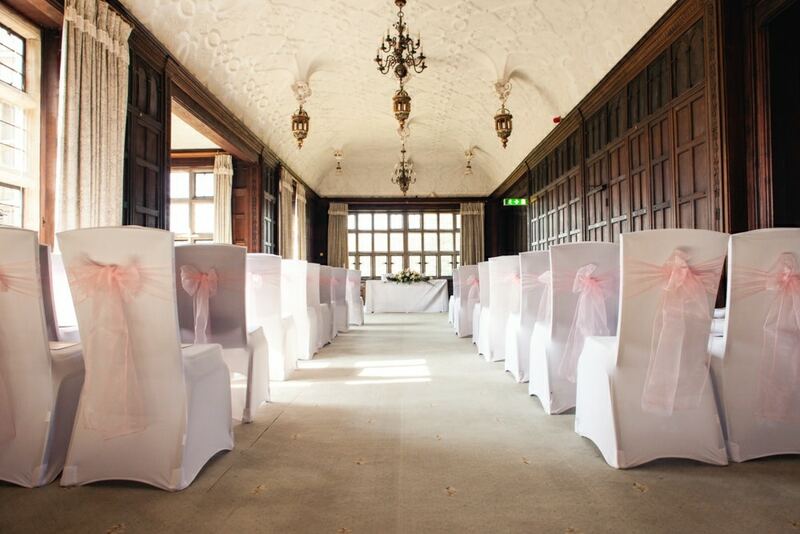 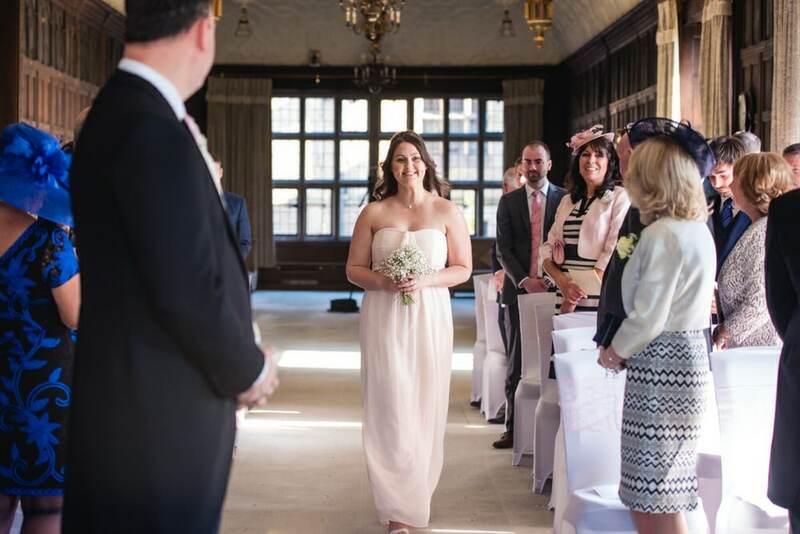 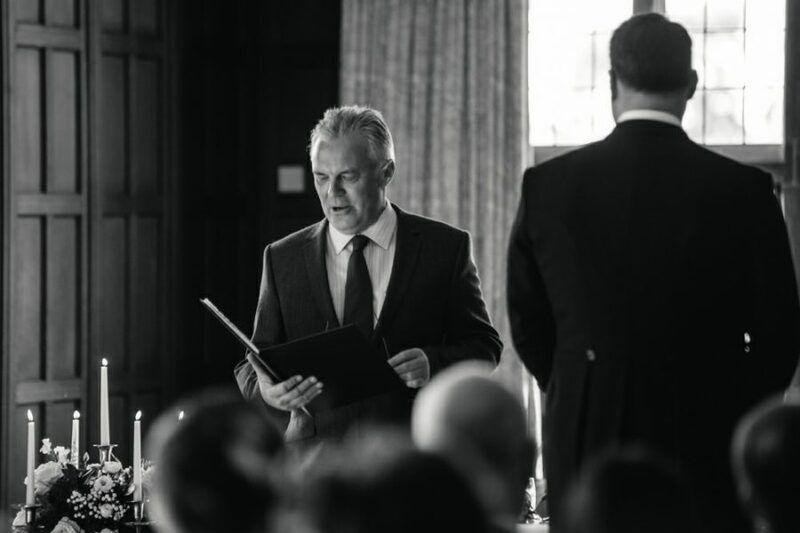 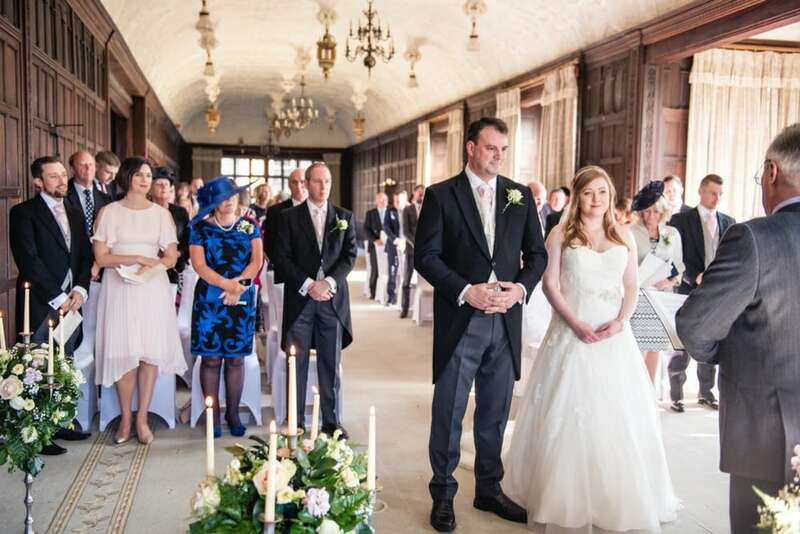 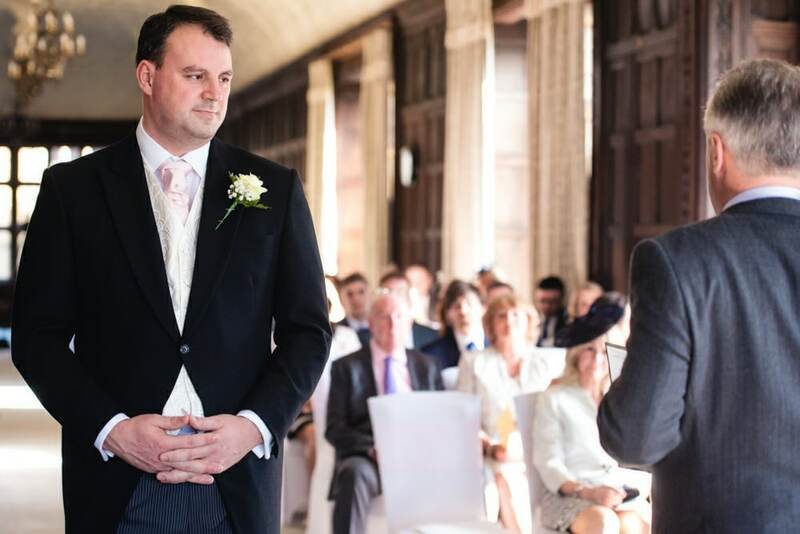 The ceremony took place in the Long Gallery which was flooded with natural light and adorned with pretty floral arrangements. 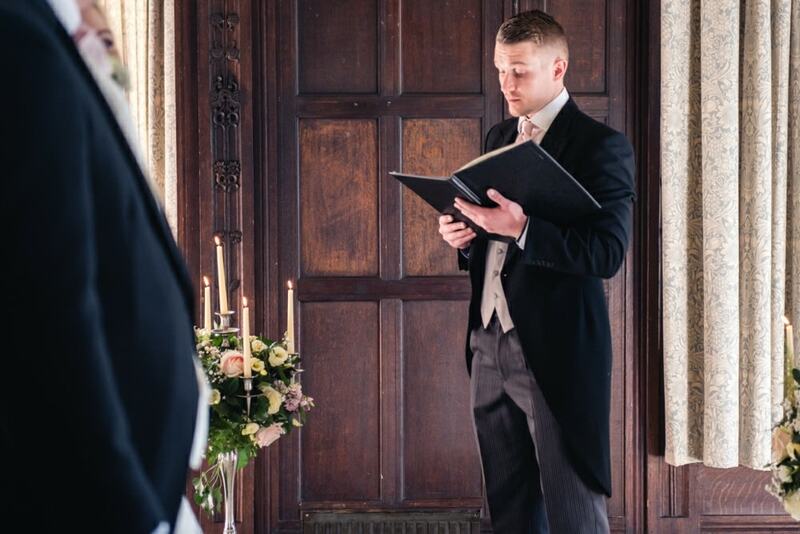 A string quartet provided romantic music by Etta James and Adele and Myles, Agnes and Bryony gave beautiful readings. 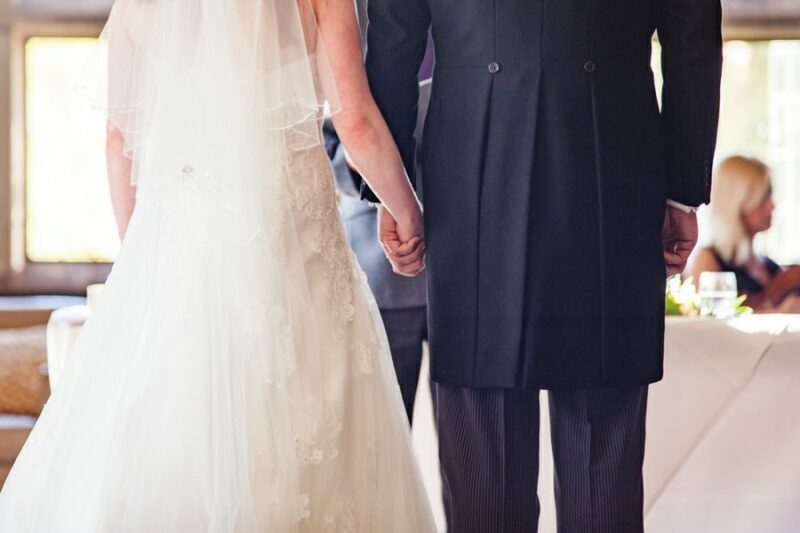 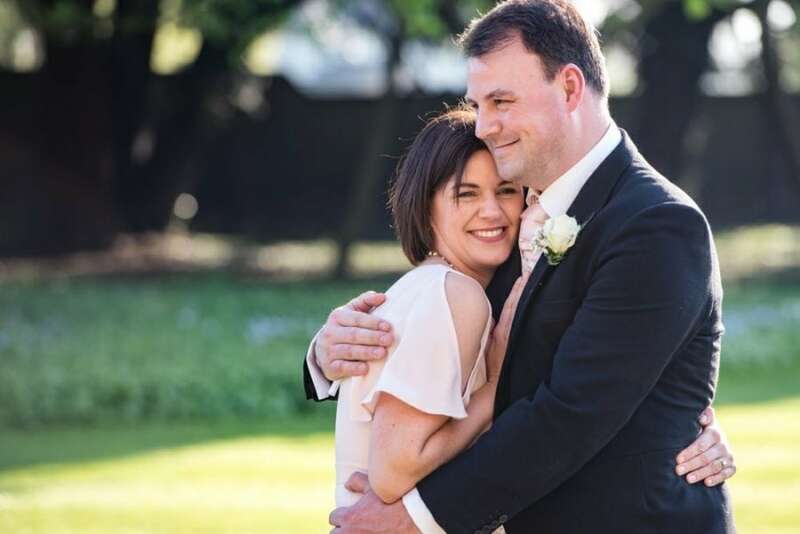 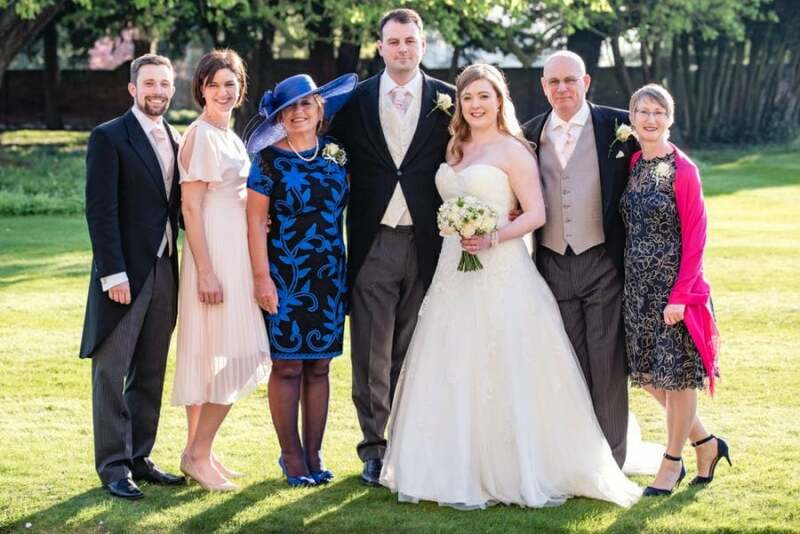 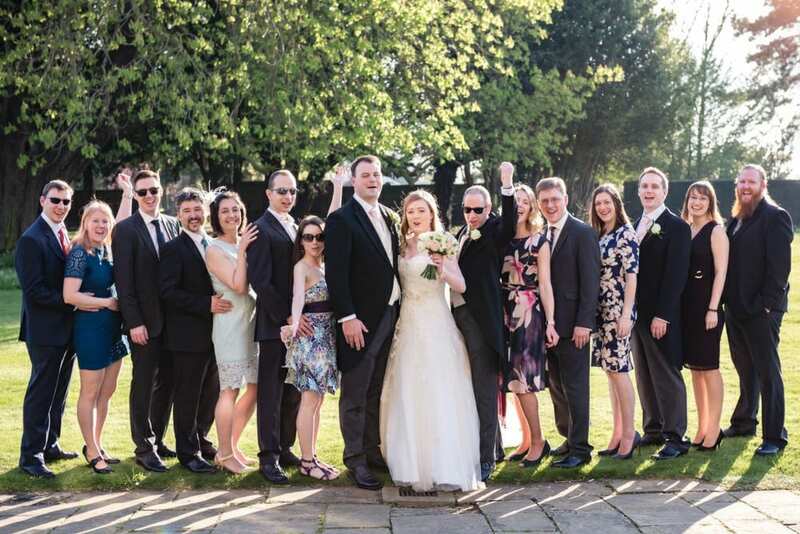 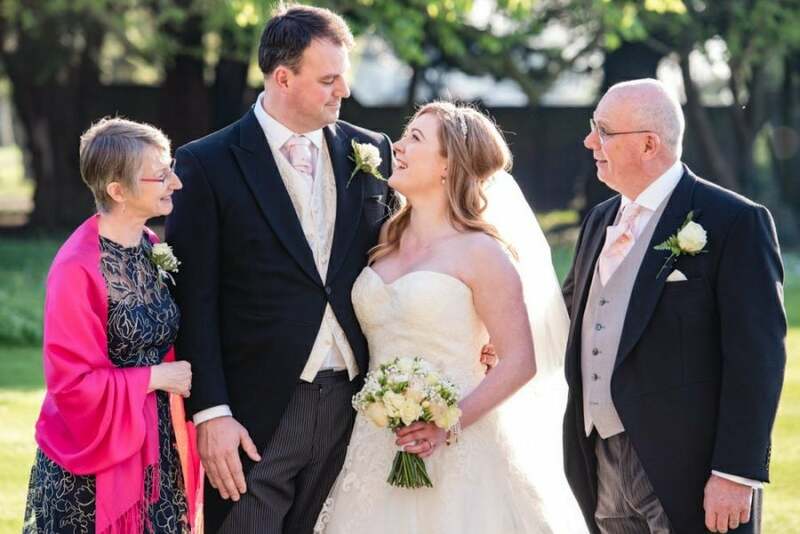 After the ceremony, the guests congregated in the warm sunshine for some Champagne and canapes. 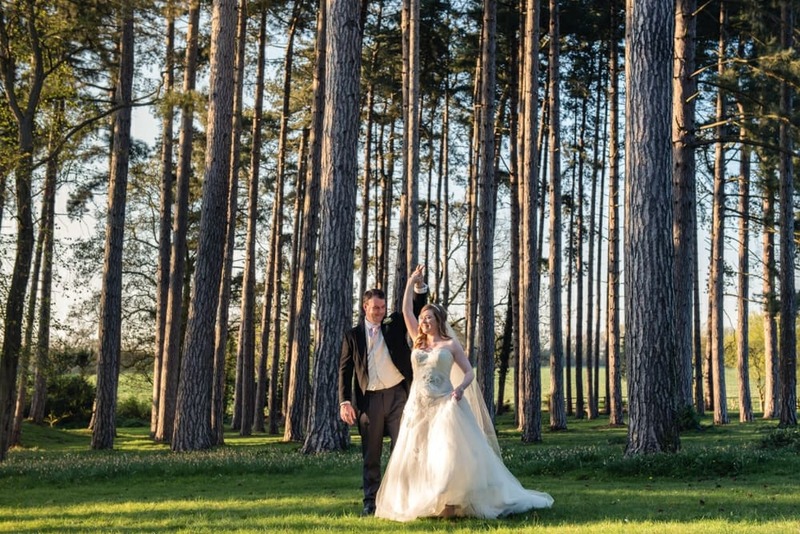 The picturesque landscape provided the perfect backdrop for family photos and confetti pictures. 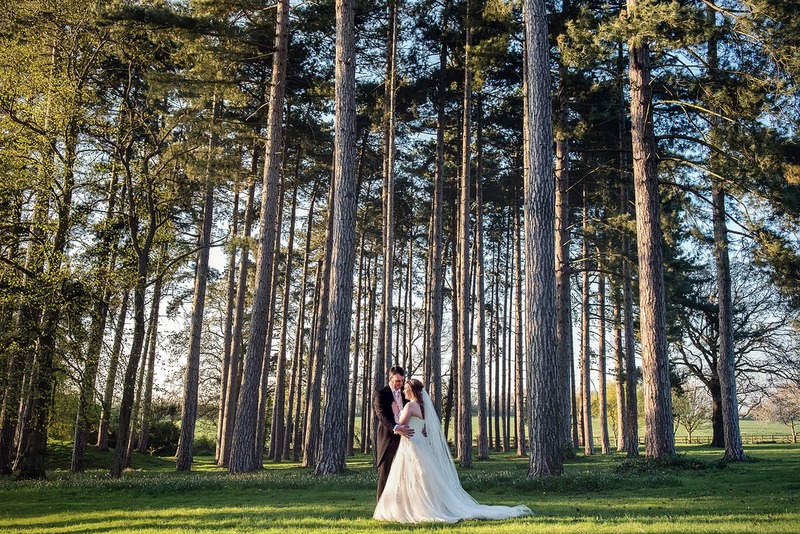 We then made our way down to the trees where we got some fantastic photos…the light was incredible! 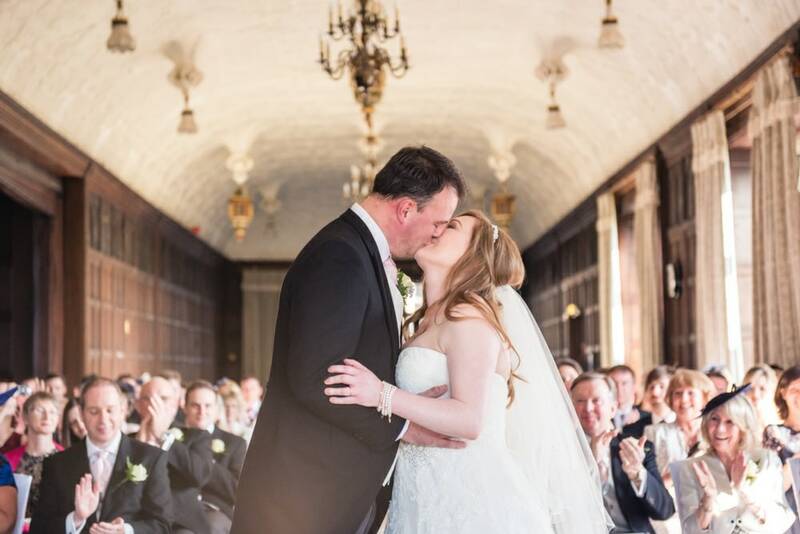 Fanham’s Hall boasts so many great photo opportunities it was hard to pick. 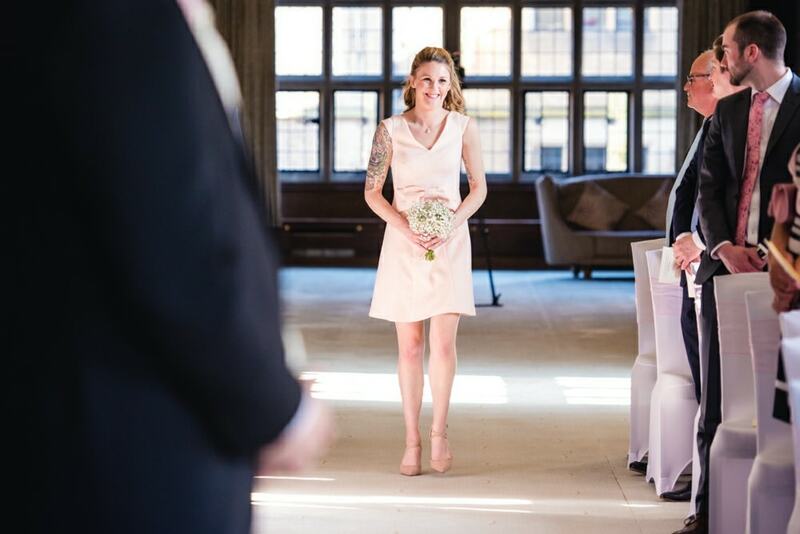 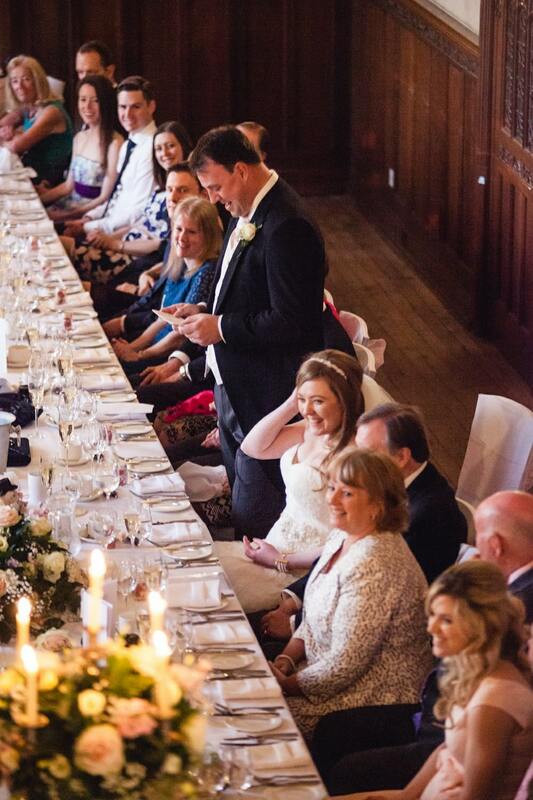 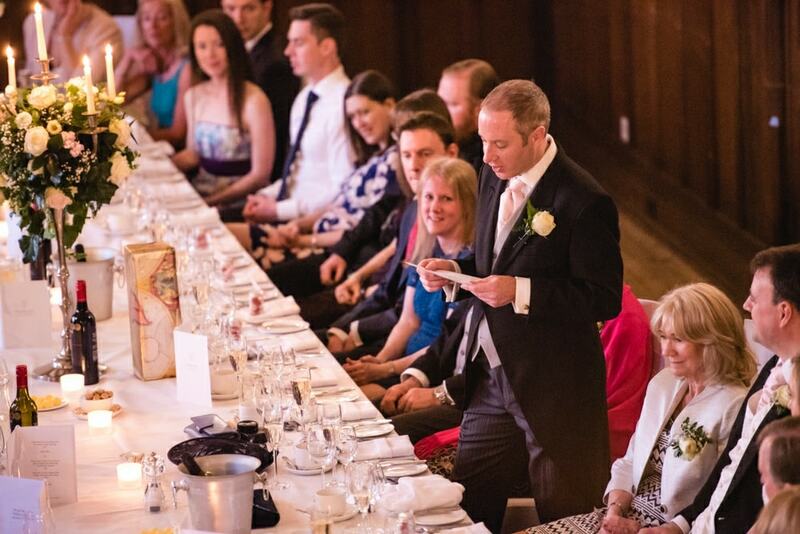 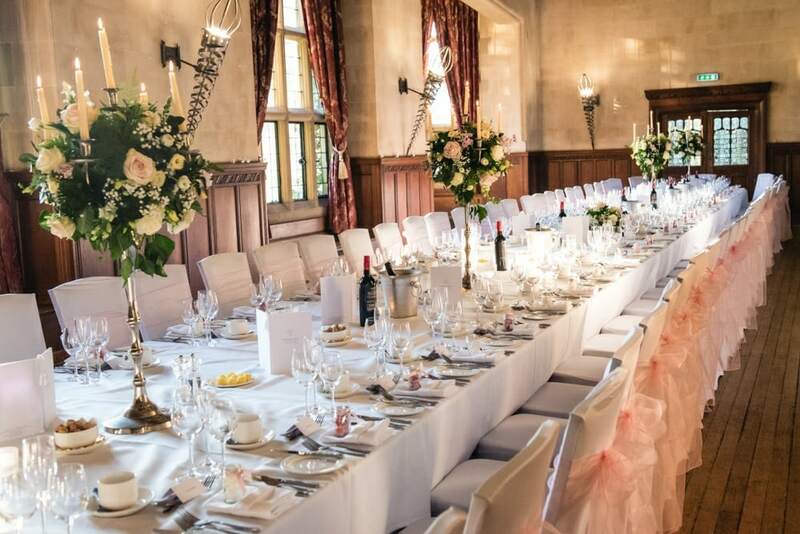 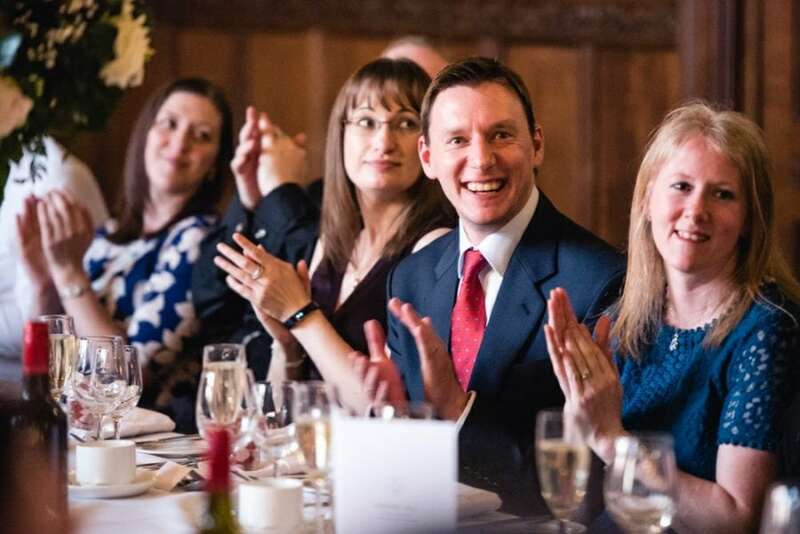 The guests were then ushered into the Great Hall where they enjoyed a delicious five course meal on beautifully decorated long tables with little mason jars filled with Percy Pig favours. 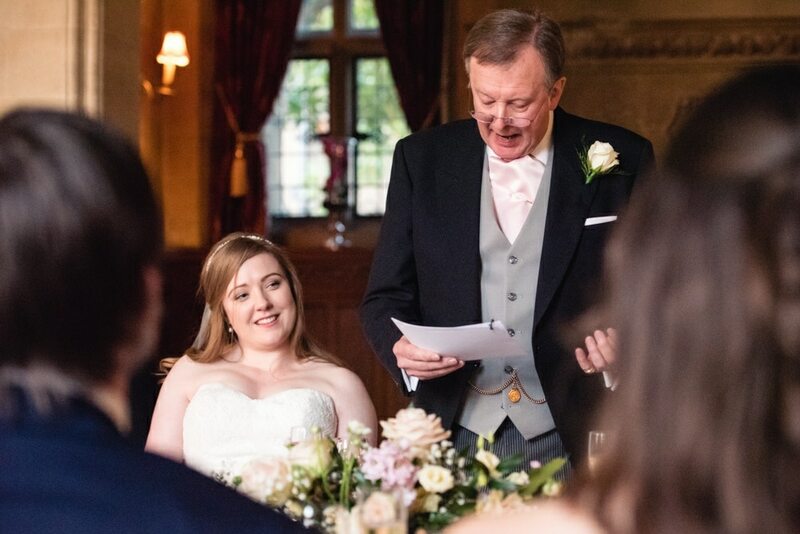 A beautiful day turned into a stunning evening and the father of the bride, groom and best man preceded to recount funny stories of the couple in their speeches. 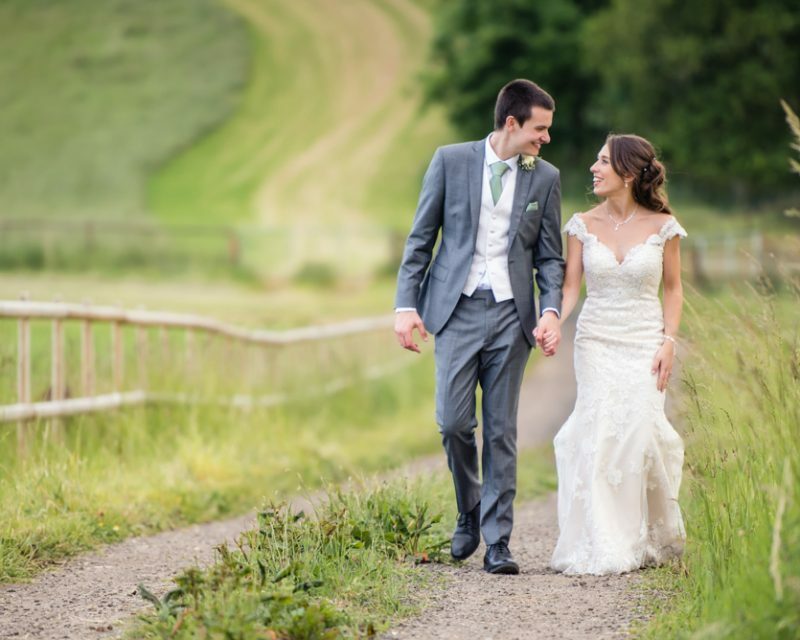 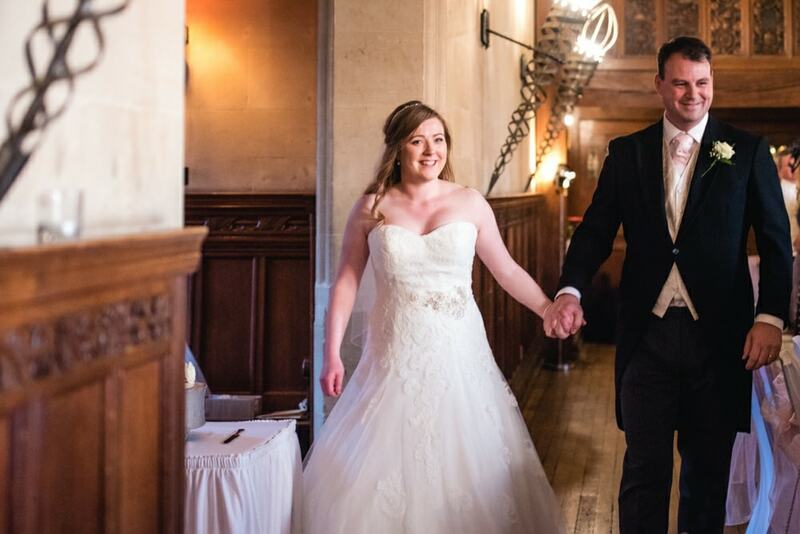 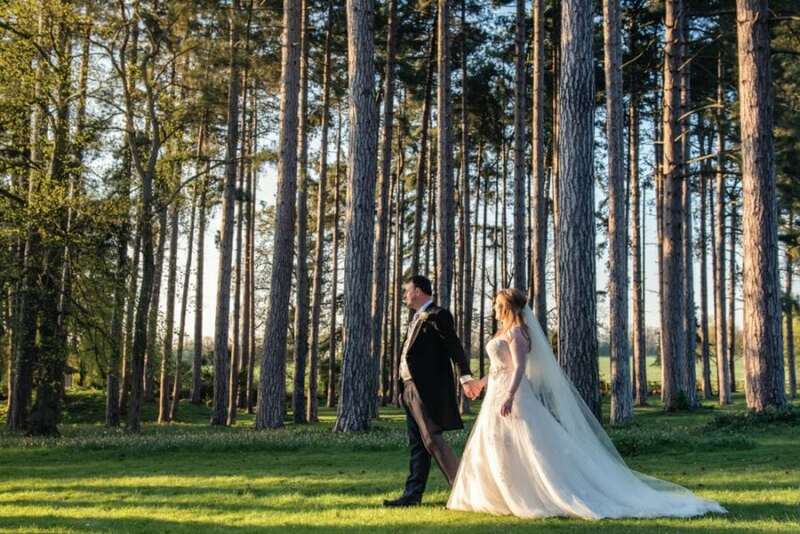 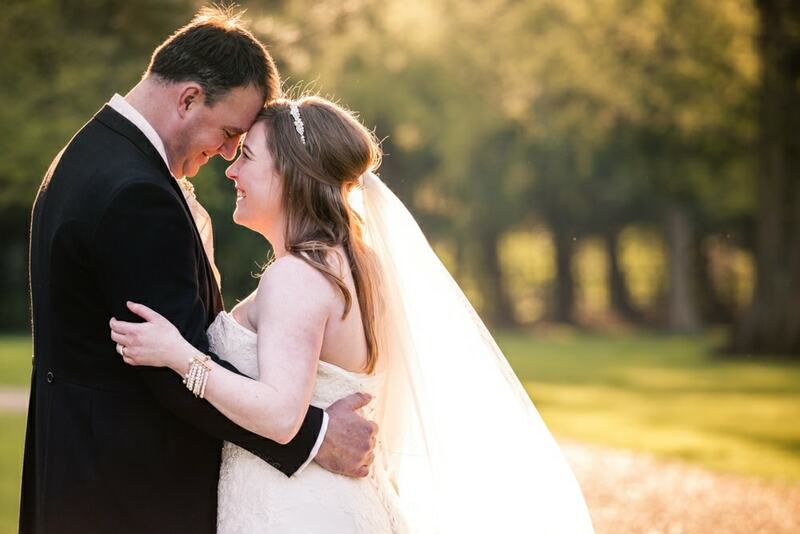 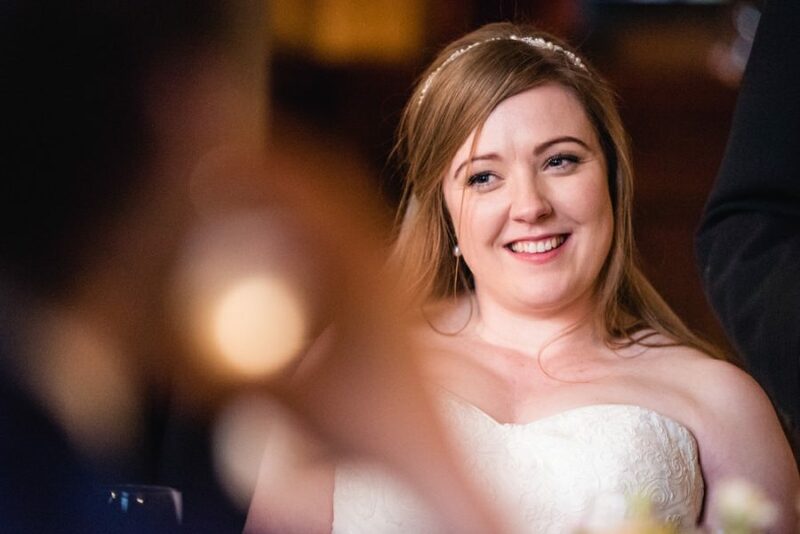 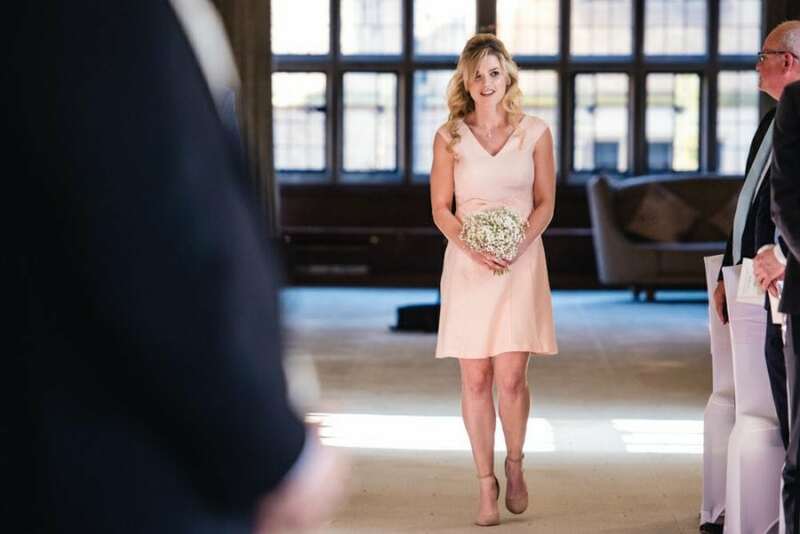 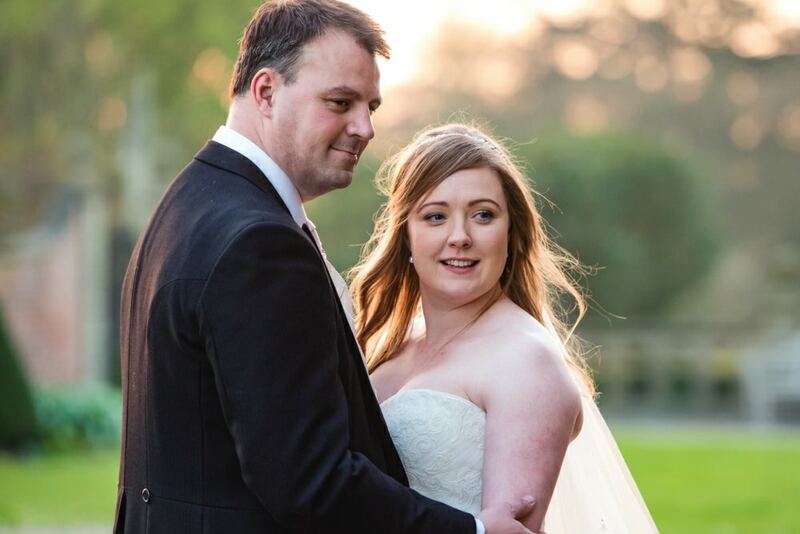 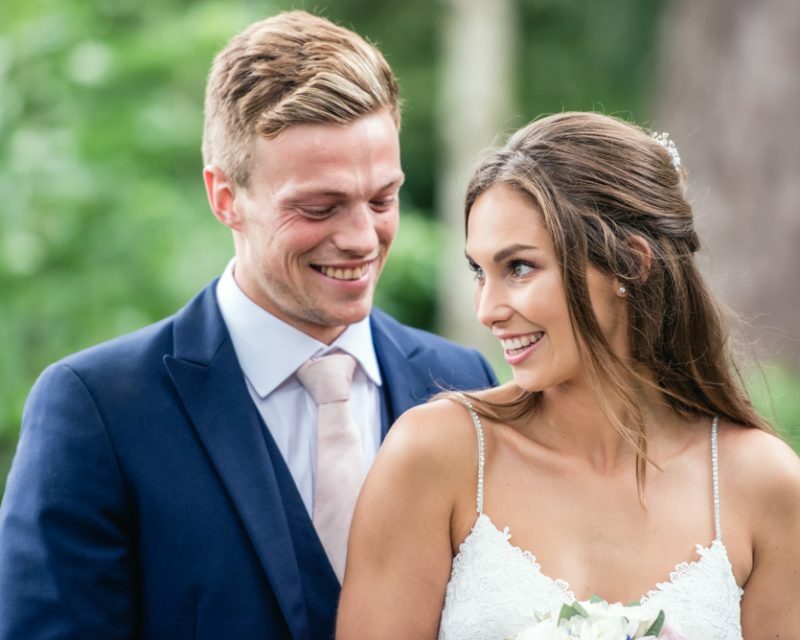 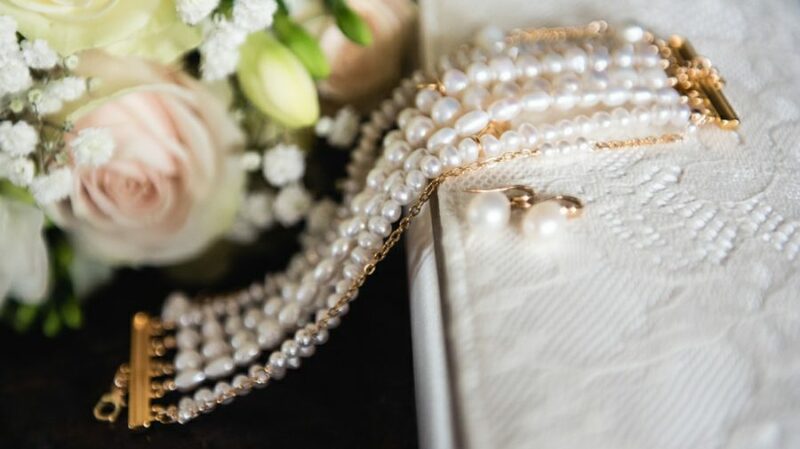 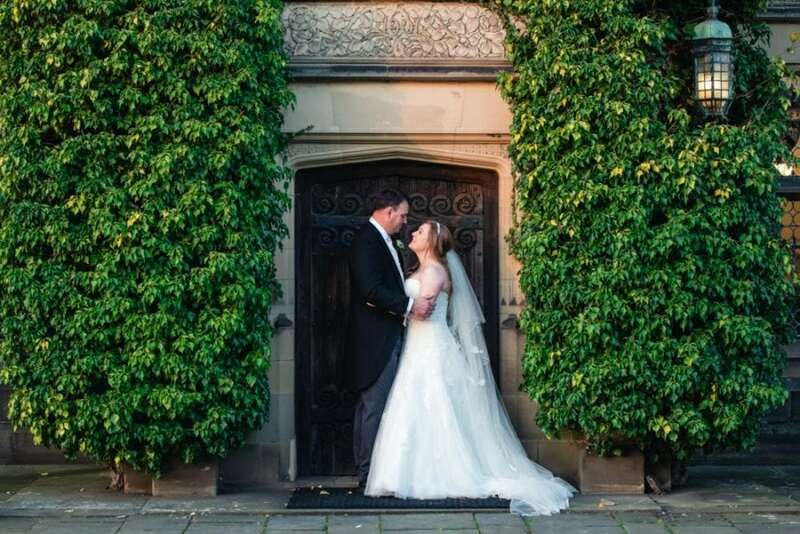 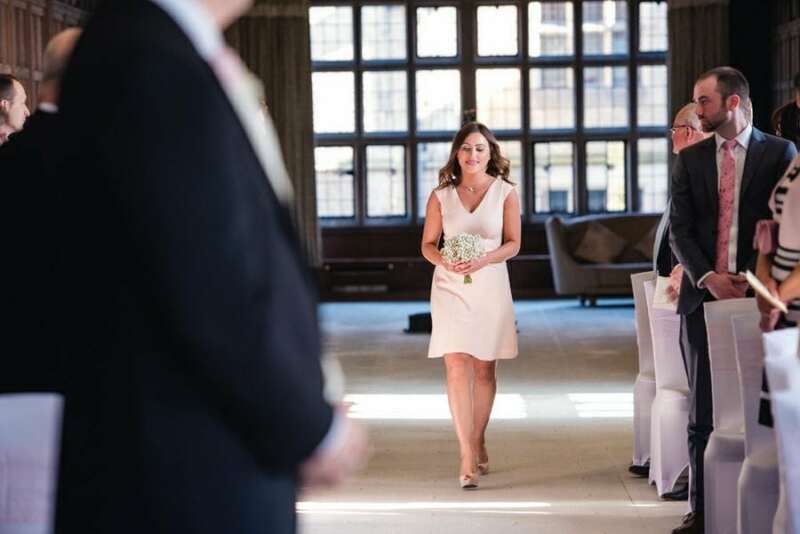 Fanham’s Hall provided the perfect location for a spring wedding and it was a pleasure to document Claire and Alex’s big day.